Highpoint Terrace is an eight-storey CLT building providing 115 social housing units for Peabody Housing Association. The project was delivered by Eurban as part of Mace’s regeneration of the London Hotel site at Elephant and Castle. Delivered in two phases simultaneously, Highpoint Terrace was installed alongside the 47-storey concrete building, Highpoint Tower. Logistics of simultaneous delivery of the two buildings on the tight urban site made solid timber the most efficient solution in terms of cost, speed & health & safety. Eurban used advanced in-house DfMA methodology to develop 4D simulations, including timed delivery sequencing, that was shared in BIM & successfully implemented in real time. Highpoint Terrace was a BIM level 2 project from the beginning. Coordination, delivery schedules and clash detection were carried out in a 3D environment using federated models. Eurban have advanced in house BIM knowledge and were engaged by Mace to work as part of the consultant’s team prior to installing the superstructure. Both the consultant M&E design and the M&E sub-contractor package were co-ordinated with Eurban prior to CLT fabrication; this was a major benefit in terms of CLT co-ordination and eliminated the need for alteration to the CLT structure during M&E fit out. Eurban’s BIM department also developed a 4D film which was used to inform follow on trades, sub-contractors and the site team of delivery times and showing the construction process. Eurban carried out full co-ordination with Axis Architects at stage 4 holding weekly BIM workshops and providing several model iterations and teams of people to deliver it. 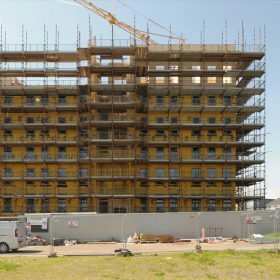 A series of advanced CLT engineering solutions developed by Eurban helped to increase speed of delivery and refine the construction process. These include a castellated wall system, concrete upstand connections and a steel bracing system that connects at the two or three-storey split in the central cores. The two to three-storey CLT lift shaft walls were delivered to site pre-lined enabling safe access to the upper floors early in the construction process. The project also features the largest CLT floor panels to be used in the UK at 15.5m L x 2.75M W & weighing 4.7 tonnes. From ground floor to sixth floor the building is based on a repeated layout; walls between apartments are structural & loads are transferred to the concrete base. At seventh floor is a split level mezzanine where walls run in the same direction but fewer are required. 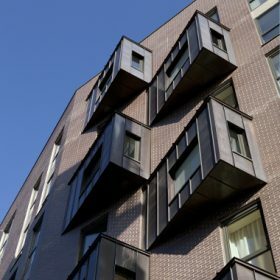 The CLT structure is installed using a castellated floor to wall connection developed by Eurban to enable vertical transfer of loads and avoid compression of floor panels. Eurban’s cast-in steel bracket detail is used to connect CLT panels to concrete upstands. Unlike most proprietary brackets, these allow tolerance in both directions acting to withstand shear forces to stop walls shearing apart as well as for high uplift loads. The five blocks that make up Highpoint Terrace are separated by four eight-storey circulation cores each housing a steel staircase, lift core & risers. The blocks are connected by vertical steel trusses developed by Eurban. Cast in steel plates connect the pillars of the bracing structure via welded connection to the concrete base. 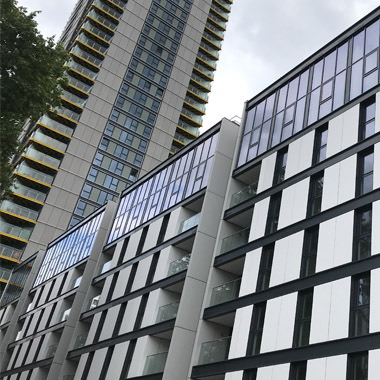 Eurban’s advanced DfMA methodologies helped Mace achieve simultaneous construction and phased handover of the two buildings, enabling early introduction of site offices and facilitating interfacing trades working in parallel. Pre-formed openings in CLT panels allowed for faster window installation making the building watertight earlier and because the external walls were not structural, they provided a substrate to which te modular cladding could be easily affixed. Roofing gullies and penetrations were pre-formed in the factory. Eurban also installed the bathroom pods which further increased speed of installation. Building with CLT allowed for approximately 80% fewer deliveries than traditional methods enabling coordination of CLT & concrete deliveries on the one way feeder road. In total there were just 64 CLT deliveries meaning reduced noise on site and minimising materials wastage. Just eight operatives were required for the duration of the CLT installation. Mace estimated that using concrete would have required 35 operatives and 250 deliveries meaning that installation of the CLT superstructure was 26% faster, resulting in savings on the frame package and approximately 2,522 tonnes of CO2 stored.